Korean brands have suddenly taken over Indian market. Koreans are very specific about their ingredients and skincare regime. So when The Face Shop came to India, I got excited and picked up few products. Today I am going to talk about their Herb Day 365 Cleansing foam in the variant Peach. The brand essence of THEFACESHOP is inspired by nature and believes that there is a natural beauty to everyone. As Korea’s first cosmetic company committed to nature, THEFACESHOP creates products from approximately 600 natural ingredients such as flowers, grains, plants, fruits, mineral water, and oriental medicine to nourish and revitalize the skin. For more information, please visit: here. Price: Rs.300 for 170ml of product. It needs to be finished in 12 months after opening. Packaging: It comes in a big tube. 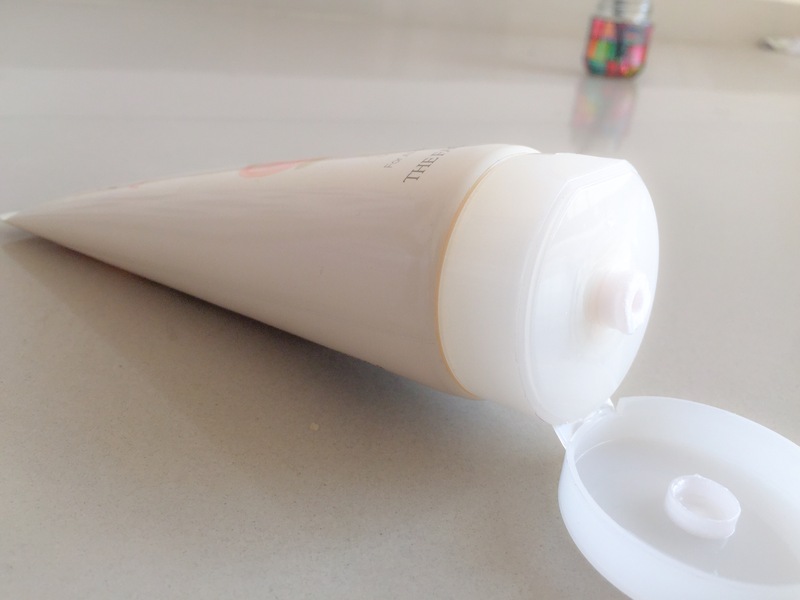 The product needs to be squeezed out from the tube, just like conventional facewash packaging. Texture: It has a pearl white cream texture (It reminds me of Pond’s white beauty facewash) and has a sweet-fruity similar fragrance. (If you have used Pond’s facewashes, you’ll relate to me here!). It foams up when used and cleanses the face to an extent that it almost destroys my acid mantle. 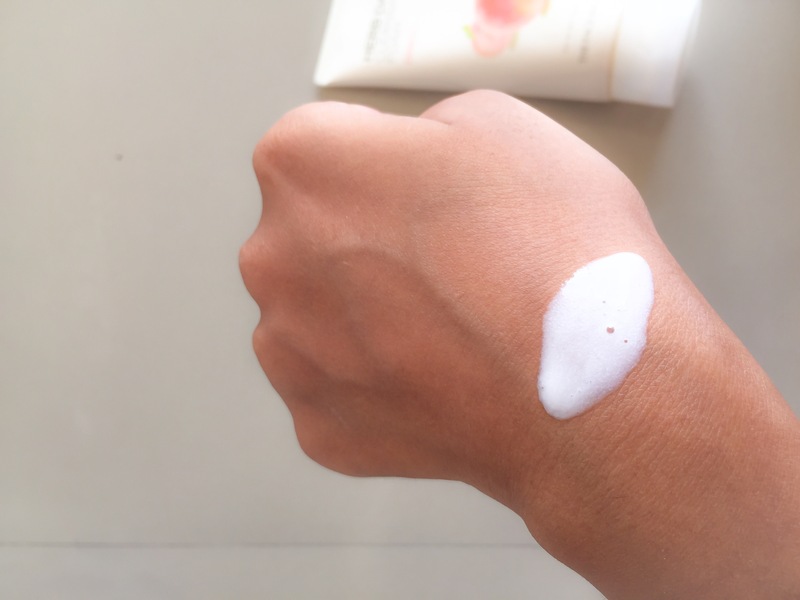 Mild cleansing foam: No! Not at all. Moisturizes skin: No! Are you kidding me? The verdict: The claims it makes are false. This is not a mild facewash at all, it strips off even the slightest trace of oil from my face. Which means, it leaves the skin very very dry. For me it is too much drying for daily use hence I use it for intense cleaning once a week. I, personally, use milder facewashes with low pH on a daily basis so that my skin remains hydrated and dirt free at the same time. But this one can be used once in a while (if you have to finish the tube, like me! ), especially in hot-humid Indian summers. But, don’t forget to moisturize your skin nicely, post wash. This comes in a huge tube which is going to take long to finish. Though it contains peach extracts, bark extract and glycerin, it’s extremely drying nature is definitely going to harm my skin. It says it is meant for all skin types but I don’t think dry skinned people are going to like this. I am not going to repurchase this. I’m finishing this anyhow because I’ve purchased it and I don’t like to waste product and my money. Anyway, feel free to go and try this (I don’t recommend this though)! Facewashes work differently on different people. If you have used any facewash from this range of Face Shop, do let me know your experience. My dry skin would definitely not like this! Even my oily skin didn’t accept it. Total waste of money. Too bad. Try Innisfree products. Their green tea range is pretty good.